L.A. Unified and its teachers union announced Tuesday they had reached a contract deal to end the six-day teacher strike, heralding “a new chapter” in public education that district officials say will protect the district’s fiscal solvency. The deal has to be approved by a majority of United Teachers Los Angeles’s 34,000 members. At an evening news conference, President Alex Caputo-Pearl said “a vast supermajority are voting yes, therefore ending the strike and heading back to schools tomorrow.” Vote counting would continue Wednesday, he said. The agreement focuses largely on lowering class sizes and adding support staff. United Teachers Los Angeles members — which include teachers, librarians, nurses and counselors — would get a 6 percent raise, and the district would invest $403 million in class size reductions and new staffing over the next three years. The district’s latest offer before Tuesday was $130 million, a sum its county overseers had already indicated might be more than the district could afford. L.A. Unified officials have repeatedly said the district is spending $500 million more each year than it takes in and that it will be out of cash by 2022. The county has to sign off on the proposed contract, then the L.A. Unified school board. The county has 10 days to do so but said it would answer “as soon as possible” after the details were received, according to a Tuesday statement. In its summary of the contract agreement, UTLA’s first item also announces that L.A. Unified’s school board will vote at their next meeting on a resolution calling on the state legislature to cap the growth of charter schools in the district while the state studies policy changes. However, the actual contract document does not address any such resolution. 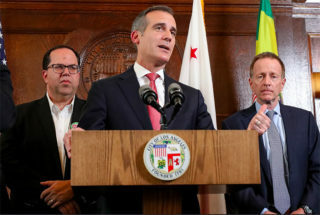 The tentative contract agreement was reached after Mayor Eric Garcetti stepped in to mediate, and after more than 50 hours at the bargaining table since negotiations restarted last Thursday. Both sides met for about 12 hours Thursday and 21 hours straight Monday into early Tuesday morning. Superintendent Austin Beutner and Caputo-Pearl spoke to that collaborative spirit at the City Hall news conference, exchanging a handshake toward the beginning. UTLA members would get a 3 percent raise retroactive to 2017-18 and 3 percent this year. The union was asking for a 6.5 percent raise retroactive to 2016-17. Class sizes in grades 4 through 12 would be reduced by one student in each of the next two years and by two more students in 2021-22. That would bring class sizes back down to what was agreed to in the previous UTLA contract, which covered 2014-17. Class sizes would be further reduced by an additional two students each year at 75 “targeted high needs” elementary schools and 15 middle schools. English and math classes in middle and high schools would also be capped at 39 students each year. The current cap is 46 students, according to UTLA. Class sizes have ticked up, into the 40s in some schools, as the district has struggled financially. Under the current contract, the district’s “fiscal distress” allows it to surpass previously agreed-to caps. The clause which allows that, called Section 1.5, will be “removed in its entirety,” the new contract states. UTLA had signed off on that clause in every contract for at least the last 18 years. The deal would hire 459 nurses, librarians and counselors, according to the district. That is more than 50 percent over what the district previously proposed. L.A. Unified says its prior offer this month had outlined 305 positions. The positions, which fall under UTLA representation, would be phased in over the next three and a half years. The bulk of the new positions would be nurses: 300, with 150 positions added in each of the next two years. About 80 percent of district schools don’t have a full-time nurse on campus right now. The district’s previous offer was to hire 176 nurses for elementary schools, according to a Tuesday news release. Library positions would increase in every secondary school, up 41 slots in each of the next two years. The district’s last offer had been for 43 new positions next year in middle schools. The number of new counselors is lower than the district’s last offer of 86 new positions next year, however. The tentative agreement would add 17 counselors next year, none the following year and then 60 in 2021-22. This would bring the ratio up to one counselor for every 500 students. The current ratio is 700 to 1. The national average is 464 to 1 based on 2015-16 data, the latest available, according to the American School Counselor Association. The organization recommends a ratio of 250 to 1. The cost of class size reductions and new staffing would be $175 million in the next two years and $228 million in 2021-22 — more than triple the prior offer of $130 million. The agreement invests in “existing schools” and would increase accountability and regulations for charter schools, Caputo-Pearl said. This has been a central talking point for union leadership, who say charter schools are channeling millions of dollars annually away from L.A. Unified. Caputo-Pearl said the pending agreement would give district neighborhood schools “a voice” in the co-location process, which is when charter schools are allotted unused classroom space on traditional school campuses under state law. The tentative contract adds these provisions, but it does not give the union veto power over co-locations. L.A. Unified will work “to strengthen the voice of educators and provide more opportunities for collaborations for all who work in our schools,” Beutner said. The contract would set class limits for students receiving special education services depending on disability. For example, it would set a maximum class size of 10 for students with autism. The contract calls for a “District Assessment Committee,” a group of four L.A. Unified members, four UTLA members and four parents who would review all current district tests and recommend how to halve the number of administered assessments at each grade level. UTLA members would be allowed a vote when a school converts from a traditional program to a magnet program. It does not grant the union a veto over those conversions, though. A pilot program that ends random searches of students would be expanded to 28 schools. Caputo-Pearl said the negotiating parties “were able to have several phone calls with state leaders to start that process” of exploring new funding sources. Gov. Gavin Newsom’s proposed 2019-20 budget already bumped K-12 education funding by $2.8 billion and would provide $3 billion statewide in one-time relief for pension costs. State voters will also have a chance to approve a tax referendum on the 2020 ballot, which, if passed, would generate about $1.4 billion annually for L.A. County schools. The county last week approved $10 million toward district mental health services. The city is intending to step in as well, Garcetti said Tuesday — including helping with anti-violence work through its Gang Reduction and Youth Development programming. “There are a lot of pieces to come from different places,” Garcetti said. Beutner told the media Tuesday that the district is putting “every nickel” it has toward the deal, addressing a question about whether the financially strapped district can afford the new demands. The district is projected to blow through most of its reserves by 2020-21. The county last week sent fiscal experts to L.A. Unified to help correct its finances, and county superintendent of schools Debra Duardo has said the county could strip the district of fiscal decision-making power if its contract with UTLA put its reserve levels irreversibly in the red. Duardo in a statement Tuesday afternoon called it “wonderful news that LAUSD and UTLA have reached a tentative agreement, and that students and staff can return to school.” She added that the county does, however, have “the legal obligation to review and provide comments [on the agreement] before the LAUSD governing board takes action.” It has 10 days to do so. The district’s most recent offer to UTLA on Jan. 11 had proposed $130 million to lower class sizes and hire almost 1,200 new staff, including educators, nurses, counselors and librarians — a considerable hike from L.A. Unified’s initial proposal of $30 million. Its proposed teacher salary raise of 3 percent for two years remained stagnant. The teachers union rejected these prior offers, noting that the proposal only lowered class sizes by a few students and didn’t ensure a full-time nurse at every school. UTLA leadership had also denounced L.A. Unified’s contract provision to add two years to how long it takes new employees to become eligible for free lifetime health benefits. That provision was removed from Tuesday’s contract, but the district intends to re-address it in future talks, the contract states. The agreement follows six days of financial tolls on both the district and its teachers. Attendance in the 486,000-student district fell more than 60 percent below normal levels each day, costing L.A. Unified $151 million, according to the district. On Tuesday, attendance was up, but still cost the district about $26 million in lost revenue for the day. L.A. Unified has saved about $10 million a day, however, from not paying striking teachers, alleviating part of that burden. Striking teachers have lost seven days of salaries so far, including the federal holiday on Monday. *This article has been updated with an evening news conference on the UTLA vote on the contract.